Cody has filed for more trademarks recently. Cody Runnels has been busy at the US Patent and Trademark office recently. 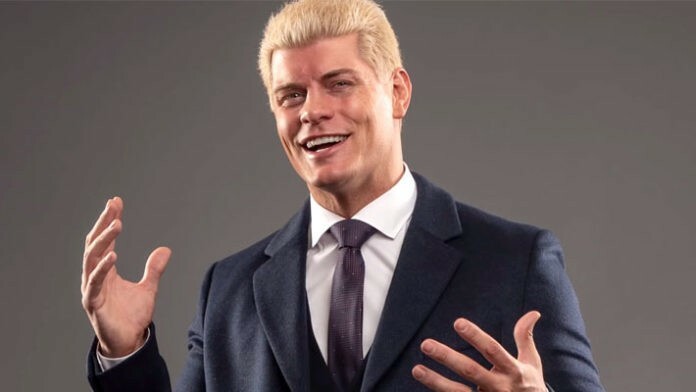 The co Executive Vice President of AEW filed for trademarks on March 10th for “the American Dream” and “the American Nightmare”. On March 14th, he applied to trademark the term “Dusty Rhodes”. Now it appears Cody filed more documents on March 18th for the term “Prince of Wrestling” and “Battlebowl”. “Bunkhouse Stampede” and “Bash at the Beach” have also reportedly been filed for. In addition to Cody’s recent trademark filings, a company named Toot Toot LLC filed to trademark the name “4 Horsemen”. Toot Toot LLC shares a business address with a company that Conrad Thompson is President of in Alabama. Marty Lunde also recently applied to trademark his character name of Arn Anderson. At the moment, the March 18th filings have not been made public at the US Patent and Trademark Office but are being reported as the case by PW Insider. Battlebowl was a battle royal/tournament concept WCW tried in the early 90s. The format of the tournament consists of 8 tag-team matches with the winners advancing to a battle royal in the main event. The tag-teams are drawn at random, meaning wrestlers did not know who their opponents or partner would be. In 1991, Battlebowl was the format used for Starrcade and two rings were utilized for the event. Battlebowl returned at Starrcade in 1992 but with only one ring. It was then used as a stand-alone PPV in 1993. The format returned in 1996 for WCW’s Slamboree PPV as well.